So much for today’s popular theory that Steve Bannon orchestrated his own removal from the National Security Council just for the sake of appearances. And the theory that his security clearance was denied? That’s also out the window. Instead the New York Times has published an insider detail, and it’s a doozy: Bannon was so upset by the move that he threatened to quit the White House entirely when Donald Trump broke the news to him. As the situation now stands, Steve Bannon has in fact decided to retain his White House Chief Strategist job after having lost his White House National Security Council job; his threat to resign was a bluff, at least for now. And his security clearance is still intact, so that wasn’t a factor. It leaves us without any first-hand guidance as to just why he was removed. Donald Trump’s close friend Roger Stone claimed yesterday that Jared Kushner has been trying to sabotage Bannon by leaking things to MSNBC (link). While Stone is unreliable and his claim isn’t confirmable, it does suggest that Bannon may have fallen out of favor with Trump as Kushner has expanded his power base. There is also an unsubstantiated claim from Fox News (link) that Steve Bannon had only been placed on the National Security Council to keep troublesome National Security Adviser Michael Flynn in line. But Flynn’s exit took place nearly two months ago, making it illogical that Bannon would just now be removed. 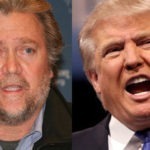 Further, that theory does not fit with this latest New York Times report (link) of Steve Bannon having fought his own removal from the National Security Council to the bitter end. Now we wait for the other shoe to drop. Is this is indeed the latest step in Bannon being edged out by Kushner, his resignation could quietly follow in the coming weeks.